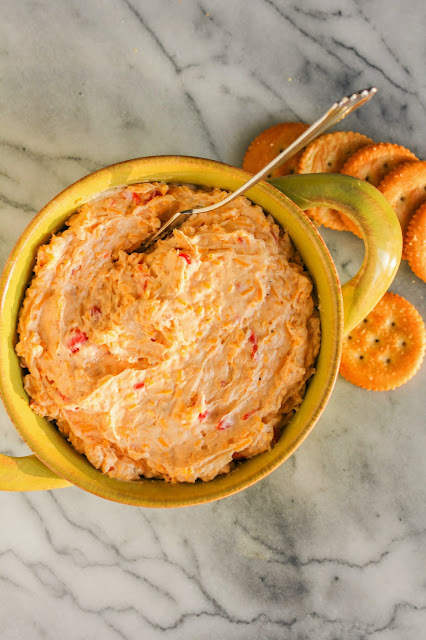 Tangy, sweet, and a little spicy, this pimento cheese spread is great on everything from crackers to veggies and is perfect for your next get together! 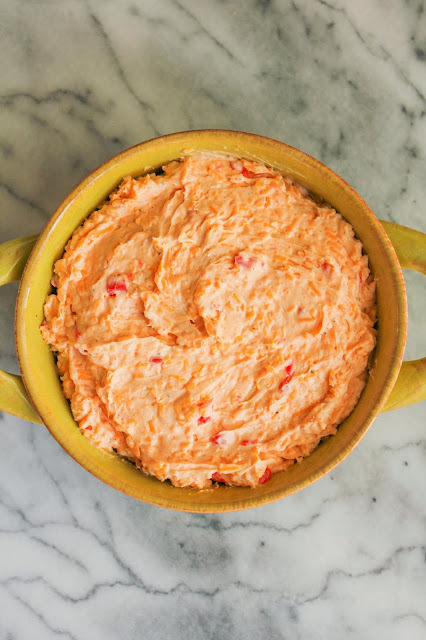 With my obvious love for cheese and all things cheese related, it should be no surprise that I love pimento cheese spread. I've always bought the little container from the grocery store and never even considered making it myself. That is, up until a few weeks ago. I decided, why not try my hand at it instead of buying it? I figured, it can't be that hard! I am really, really happy that I talked myself into making my own recipe. This cheese spread is amazing, people. AMAZING! The longer it sits in the refrigerator the better it tastes. It's creamy and cheesy and tangy and just a bit spicy. But most importantly, it's delicious. I spread it onto every single kind of cracker that we had in the house. I dipped my veggies in it. I want to make a grilled cheese sandwich with it. But that will have to happen later because, you see, we ate the whole bowl of spread! My boys loved it, too. This would be a perfect dish to make and take to potlucks or BBQ's. It's crazy simple...just throw all of the ingredients into a food processor and whip it up. Whip it up good. That's it. Done! Give it a try and let me know what you think! I'll be making another batch for the family for our Memorial Day soiree. Place all of the ingredients, except the salt and pepper, into the bowl of a stand mixer. Using the paddle attachment, beat on medium speed until completely combined. Season with salt and pepper. Serve with crackers or cut vegetables. I'm thankful for my partnership with the United Dairy Industry of Michigan and I thank them for sponsoring this post! I was compensated for developing a recipe using Michigan dairy products. As always, all opinions are my own. UDIM, branded as Milk Means More, is the umbrella organization for the American Dairy Association and Dairy Council of Michigan. Their goal is to promote Michigan’s locally produced dairy products and reconnect consumers with the people behind their food.